Collage created by Joe Fitzgerald, National Library of Medicine, National Institute of Health. Used with permission. The National Library of Medicine, a part of the National Institutes of Health in Bethesda, Maryland, made its major scientific online database, MEDLINE, available freely and easily on the World Wide Web in June 1997. The new service was an immediate hit, and MEDLINE usage skyrocketed from a pre-Web 7 million searches a year to more than 250 million a year less than 3 years later. When the NLM discovered that one third of these searches were being done by the public, for their personal health and the health of their families, the Library immediately began planning a new program to reach out directly to consumers. 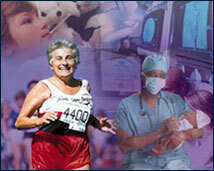 MEDLINEplus (http://medlineplus.gov/) was created as part of this effort and introduced on October 22, 1998. It provides Web users with access to reviewed, authoritative health information -- from the NLM, the National Institutes of Health, other government agencies, and from selected non-government organizations. The new service provides access to extensive information to nearly 400 diseases and conditions (cancer, diabetes, etc. ), an illustrated medical encyclopedia and medical dictionaries, lists of hospitals and physicians, health information in Spanish, and information about prescription and nonprescription drugs. It also integrates information from the new NIH/NLM database ClinicalTrials.gov, a source of information for patients about over 4000 federal and private clinical research studies. One unique feature of MEDLINEplus is a series of preformulated MEDLINE searches on various aspects of diseases that return up-to-date reference and abstracts useful to the general public. The NLM is now engaged in a nationwide outreach program to alert consumers about MEDLINEplus and also to support through grants and contracts a variety of community organizations -- public libraries, hospital libraries, local government agencies -- that can provide electronic health information services directly to the public.